CD5 invites you to our Primary Night Party at Keegan’s! Tuesday, August 14 at 7:30 PM, we will provide appetizers and you can enjoy the election results with your fellow Republicans at the famous Keegan’s Irish Pub. We will start out on the back patio, then move inside later depending on the weather. RSVP Here! Jennifer Zielinski is the right choice for Minnesotans, because you count, you matter! Jennifer Zielinski, Endorsed Republican Candidate for Congress in Minnesota’s 5th. Jen has lived in the Twin Cities her whole life and currently resides in South Minneapolis. She works in health care. Jen has also been a Republican activist for over 10 years, working on campaigns while helping build our party. The issues Jennifer Zielinski plans to fight for in this campaign are to keep the economy growing, continuing the Trump tax cuts, while protecting both our 1st and 2nd amendment rights. Jen will also work to ensure we fix the problems with affordability and effectiveness of healthcare, improve education for all Americans and also work to address the opioid abuse crisis that is facing our nation. 2018 is an important election year. Driving out the vote in our district is essential to winning state wide elections. Our get out the vote effort here can turn Minnesota Red! It’s been a long time since CD5 has promoted our candidates with a sample ballot. Many Republicans voters only vote presidential years and if we can encourage them to vote this year, it can make a huge difference in a gubernatorial year. 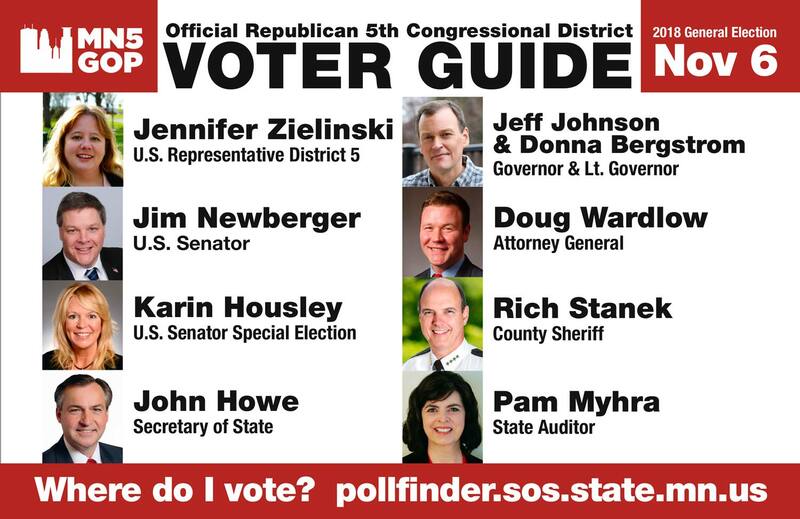 This is expensive, but a proven effective marketing tool that will help all our candidates: Jeff Johnson, Karin Housley, Jim Newberger, Pam Myhra, Doug Wardlow, John Howe, Sheriff Stanekand of course Jennifer Zielinski. State Wide Elections are won and lost in the 5th. 2-3% improvement here allows us to not only take the Governor’s Mansion but potentially sweep the state outright! We all want to turn MN Red, but how do we do that? Ok, easy to say, but for real how do we do that? Its time for the rubber to meet the road and put our money where our mouth is: that’s why we need to fundraise! Why Give to the 5th Over Candidates or Other Districts? Our Data and GOTV helps not only the state wide capture that 2-3% to win but also helps everyone up and down the ticket. From Governor to local races as well. We are the best bang for your buck. Our close geography and incredible fundraising events allow the best opportunity for candidates up and down the ticket to interact with the voters who truly will be the deciding factor in turning MN Red! We here in MN’s 5th Congressional District know what its like to fight from the heart of the beast. We know the struggles of fighting the uphill battle. And we also know how to look at the big picture. We here in the 5th know that we make the difference in turning MN Red and winning state wide elections. You know what else we know how to do ? To have a great time! The one thing we always focus on is having a good time. Win or lose, lets enjoy the battle and the journey! As a republican here in the 5th sometimes it feels like you are on an island all by yourself surrounded by DFL neighbors. We all know the feeling. That’s why we here in the 5th love to host the best events around the state. Join us for great events! From family fun events to great speakers, from high class events to get dressed up for to casual social events to meet your fellow local republicans, from events to talk politics to those that are just about having a fun night out. No matter what event you plan to join us at we can promise you a great time!